That looks like something Trump would have built back in 1984. The original land grant in 1705 to Trinity Church by Queen Anne was 215 acres. I think the northern boundary was what is now Christopher St, far outside the then city limits. Today they own about 14 acres of prime real estate. The first permits are up for a new 44-story mixed-use tower at 68 Trinity Place, which has apparently seen a height increase since Pelli Clarke Pelli was chosen to design, last July. Trinity Church will occupy 93,180 square feet on the first seven floors, while 111 residences will split 157,185 square feet on upper levels. The tower’s total scope will measure 250,995 square feet, and it will stand 499 feet tall. The 42nd and 43rd floors will each have one penthouse residence. Pelli Clarke Pelli’s scheme placed a 25-story tower atop a seven-story base, so the residential component has apparently stretched skinnier and taller. This would not be unexpected given the vertical progression of other projects in the neighborhood, many of which will soar well over 500 feet. Unfortunately, the new tower at 68 Trinity requires the demolition of a handsome pre-war structure, though per the Church, it has decayed considerably on the inside. With Pelli Clarke Pelli hopefully still designing the replacement, it should be attractive; despite the loss, the added density will benefit the neighborhood, which can still feel desolate outside of office hours. The Stephen B. Jacobs Group is listed as the architect of record, and construction is expected to begin this fall, with completion set for 2017. 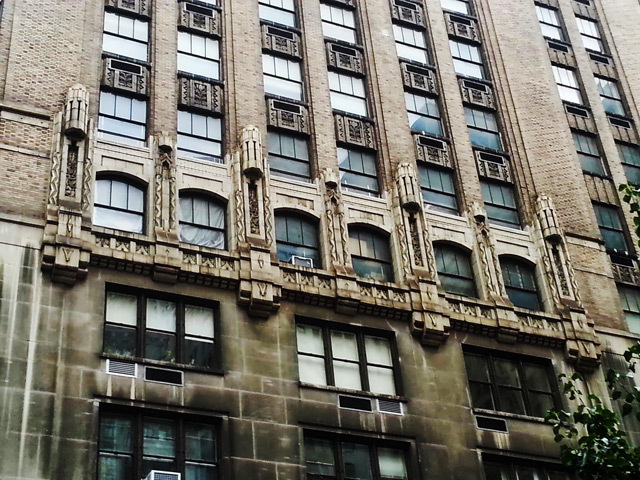 Another piece of laborious stonework thrown to these savages (we know as NYC developers) to feed their greed. Might as well bestow references to Trinity's real deity all over their church -Mammon. Talk about a city/organism/thing that just devours itself. Nothing is truly holy, not even Holy itself. Rev Cooper, I'm sure you're familiar with the word philistine. Not the one in the Bible, the one with the small p.
Is he the mastermind behind this impending destruction? The public deserves to know who is behind this selfish, greedy act. Cooper has been the rector of Trinity since 2004. His tenure has been contentious among the governing body. Some former members have said that the church has lost its way. This "spiritual leader" obviously forgot what Jesus said about money (i.e., render unto Caesar what is Caesar's). And unto Trinity Church what is Trinity Church's. 1. I'm appalled at the destruction of a truly beautiful, classic New York building - the type we'll never see any more of. 2. I'm appalled at the wretched, uninspired profit-maximizing crap these criminals plan to build. This is something you'd expect of a Solow or Macklowe doing anything to squeeze out a few bucks - not a "non-profit." 3. I'm appalled this "church" is allowed to register as a non-profit organization with tax exemption. If we can't change (1) or (2), can we at least finally address the farce that is (3)? Heartbreaking. The most unfortunate decision for NYC architecture in the last year (last 5 years?) moves forward. Appalling what regard Trinity "Church" seems to have for this city and one of the most beautiful parts of it - a Gothic, brooding, and freakishly gorgeous and well-preserved tout ensemble of 19th- and early 20th-century gems. ... Until now. A few months after ground was supposed to be broken at 68-74 Trinity Place, Trinity Church has filed a demolition permit application with the city’s Department of Buildings, according to agency records. The demo permit application is pending, according to a DOB spokesman, and the church’s application for a new 40-plus-story residential and office tower was disapproved on Oct. 10. The property contains a through lot between Trinity Place and Greenwich Street as well as two irregularly shaped interior lot portions, for which the zoning resolution would require the provision of rear yards with a depth of 20 feet, the CB1 resolution noted. 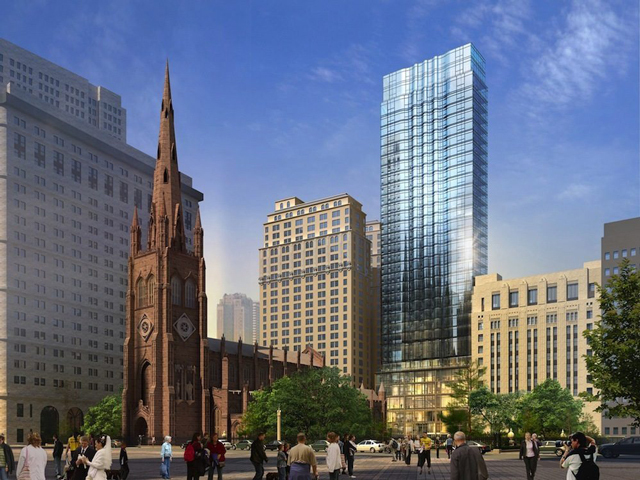 On Nov. 20, the board recommended that BSA grant the variance in order for Trinity Church to develop the parish hall and residential tower, which would reduce the building to 46 stories from 48. Reverend Dr. James Cooper, 17th Rector of Trinity Wall Street which owns Trinity Church, announced in July 2013 that the church’s vestry voted to replace the 90-year old structure, asCommercial Observer previously reported. The existing structure is comprised of a six-story building at 68 Trinity Place/103-107 Greenwich Street and a 25-story building at 74 Trinity Place/109 Greenwich Street. Pelli Clarke Pelli is designing the new building, on a site the church has owned for at least 75 years. The residential portion will be “developed by a third party that would also construct the core and shell of the residential development, which would subsidize the construction of the Parish House,” the CB1 resolution notes. Trinity Church hasn’t yet selected that developer. The church will move into the first seven floors, spanning 93,180 square feet, and the apartments will occupy 157,185 square feet above, New York YIMBY reported in the fall. According to the August plans submitted to DOB, there will be four apartments per floor on floors 10 through 25, three units per floor on 26 to 38, two apartments on floors 39 to 41 and one apartment each on 42 and 43. The amenity spaces will be on floor nine and mechanical space will be housed on floors eight and 44. The new building will contain a parish hall, facilities and offices for Trinity’s ministry, the Sunday school and rooms for use by community organizations, of which more than 60 currently use 68-74 Trinity Place, a July 2013 church press release indicated. In September, church offices relocated from 68-74 Trinity Place to 120 Broadway, a church spokesman noted. The church’s spokesman said no one from the church was available to talk due to the holidays. Jesus came to Earth to destroy "religion." Only the word of the Lord as expressed through the Holy Bible (not what is said in the "church") is the true path to the Christ. This is one Church which is in touch with its inner-Mammon. It's not nearly as bad as that new McSam Holiday Inn across the street. Too bad that's our standard for new architecture in the Financial District. I recently ran across an interesting historical tidbit about Trinity Church. They were the owners of the private St. John's Park surrounded by townhouses which I'm told was an equal to Gramercy Park in design and social standing. They sold out to a railroad who flatened the park and built a huge train depot that crushed land values and basically destroyed the whole neighborhood. In later years the land was sold to the State.